Best known for her role in the important classic series A Different World, she has also appeared in Hangin' with Mr. Cooper, in addition to her long list of voice work including the Spider-Man animated series, Futurama, Cleveland, and Inside Out. These days she can be seen portraying Patrice Perry on TNT's Major Crimes. Dawnn's strong voice of advocacy has been vital in bringing attention to many important causes, with that in mind it inspired longtime friend Ki Ki Shepard, a carrier of the sickle cell trait and founder of the K.I.S. Foundation for Empowerment, to seek Dawnn's participation in the organization. Also, having been actively involved in the EmpowHer Institute, Dawnn enlisted the support of the Los Angeles Urban League. This word of mouth and the conversation brought forth some of the most talented names in show business to volunteer their performances and their time to this worthy cause. 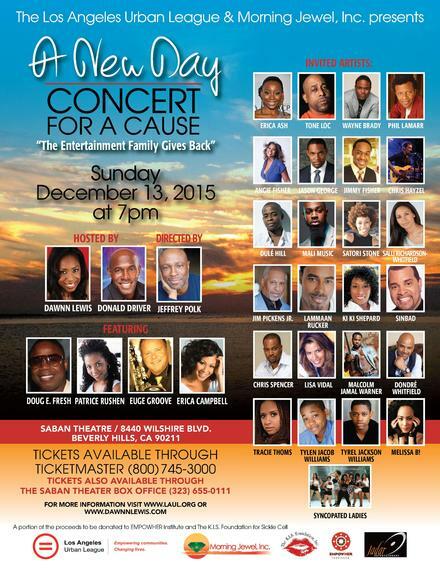 A Concert for a Cause, an event to fund sickle cell research, takes place this Sunday. Dawnn and I caught up recently for a fun conversation about all that's going on with in her world and how she's contributing to ours. Thank you so much for taking the time to talk to me today, it's greatly appreciated. Thank you, as well. I appreciate it. It's hard to believe how many years have passed since you were on A Different World. You are still every bit as beautiful as you were then, haven't aged a bit. I mean that. That's nonsense, you seem to be in great shape. You've obviously taken great care of yourself. You know what, I don't go to the gym. I've always been very athletic and kept very active. I used to run track. I literally have no desire to get a gym membership. That's a shocker, you've got to give up that secret. What is it that you're doing to stay in great shape without going to the gym? Believe it or not, I just power walk. Of course, I really watch what I eat. I love food, and I love good food. The plot thickens, you don't go to the gym, you just power walk, and you're a foodie? Are you human? (Laughs) I do all things in moderation. I do stay active, I like to golf, horseback riding, and I like to do my power walk laps around the golf course. And, I am the biggest kid you'll ever meet. Okay, what do you like to do when you're embracing your inner child? What I like to do when I'm embracing my inner child; okay, you can't judge me. No judging. There's just been a new rule put on the books; you cannot be an interviewer who has the opportunity to talk a childhood crush and pass judgment. True story, it's on the books. Excellent! I love it!! (Laughs) I am the ringleader of a very fierce and very competitive red light, green light 1-2-3. Anything that I've done where there's been kidding around, while everyone is in the serious production meetings I'll be out with the kids playing red light, green light. I have my own personal collection of Super Soakers in various sizes. I used to love those so much. I'm the one that disappears for a few minutes from the family barbecues, when I reappear I'll have some of my nieces and nephews with me and we'll be armed with Super Soakers attacking all of the guests. I always loved getting the biggest Super Soakers, they would be so big it would take like 20 minutes to fill up. Then you'd get one 10 second shot out of it before you'd have to refill it. I always make sure I get the biggest Super Soaker, that's my rule. When I was a kid, there was nothing better than water balloon fights. I grew up in Brooklyn, we had the fire hydrants, and we would open up a soda can at both ends and squirt people walking by. I love the kinds of things that encourage you to let your guard down, be open and vulnerable; and just to be laughing sincerely. I've been blessed to spend time with young people and help encourage an environment where it's comfortable for them to be who they are. That's precious for children. Do you think that kids aren't getting outside and being kids enough these days? It's very disappointing, the sense of interaction, community, social skills almost doesn't exist anymore. These devices are so overstimulating that once they're in front of people, it's like there's nothing left. Just a blank. Just having a conversation becomes a challenge. So, true - it's like if it doesn't have an "i" in front of it, it's meaningless. Tell us about your recurring role on Major Crimes. First, I just want to say that I love the people on the show. Everyone who works on it is so nice, personally and professionally. They're all very tight and supportive of each other. The fans are loving how my character, Patrice Perry, has been brought in as the unlikely love interest of Detective Louie Provenza played by G.W. Bailey. The fans have given us one of those cool couples name mashups. It's either one of two; Protrice for Provenza and Patrice, or Patrenza. I like Patrenza because I get first billing. That's a very cool idea for an unlikely romance. Plus, you're surrounded by a very talented cast; Mary McDonnell, G.W. Bailey and Tony Dennison. Yes, yes!! All phenomenally talented people. Aren't you going to be in a musical film soon? Am I right? Yes, sir. I will be playing Cleo in a film called Revival. The film is written and produced by Harry Lennox from The Blacklist. Harry is a highly acclaimed actor and producer. The film discusses the days after Christ's resurrection. Chaka Khan, Michelle Williams, and many other talents, it's a fantastic film. Will we be hearing you blow in this? Yes, I will be doing a little bit of singing in the film. Fantastic, I'll look forward to seeing that. Let's talk about this Concert for a Cause, this is for an amazing cause and you've got an incredible set of people participating in it with you. I'm so excited about this, all of these people that we love to see on television and in the movies, volunteering their time and their talent for a worthy cause. Ki Ki Shepard and I have been friends for 20 years and she asked me to be a part of this because she knows that I like to be active in the community, and I'm blessed with the brand of getting things done. We all know you best for your role in A Different World. The show means a lot to so many people. I can remember seeing it and being in so much awe because it was a show about us as intellectuals and living in college life. We all know that exists, but television never depicted it before. It's still important to me today, and I find it to be a blueprint for how television and film should depict us. What can you tell us about the plans for a cast speaking/scholarship tour? Believe it or not, it's been 28 years since the premier of the show. It's on somewhere at some point in the day, all day, every day. It's on all over the world, and it's pretty amazing to see how much that show still touches and impacts people. We'll be sharing our own experiences. We will have experts speaking to empower the young black community and instill financial, technological, professional and other social skills. 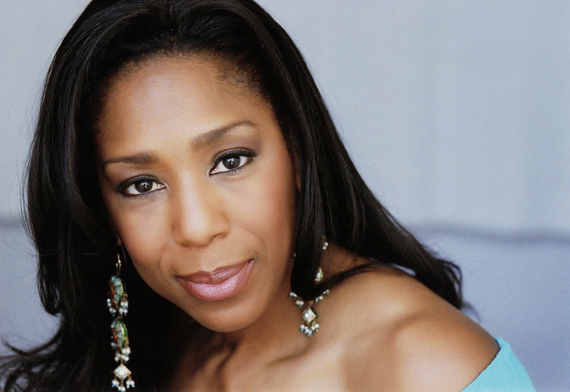 For more on Dawnn Lewis, visit her website for extra treats - including her lovely singing voice. Also, get tickets for Concert for a Cause on Sunday, December 13th on Dawnn's site.